Club Penguin Cheats by Mimo777 Club Penguin Cheats by Mimo777: Club Penguin Play Awards and NEW GAME! Woot! Club Penguin Play Awards will be here on March 19th! We will get to vote for our favorite 2009 play. This red carpet event is a blast and we get to meet lots of famous penguins! Also, this month Club Penguin will be releasing a NEW game! Cooliosis! Club Penguin says you will "need to be quick... and ready to come to the rescue" for this new game. Hmm, what do you think this game could be? Do you think it will be in the Cave when it reopens? Don't forget, Rockhopper comes this week! Whoo hoo! Do you like to draw? Play Shidonni! Yeah! 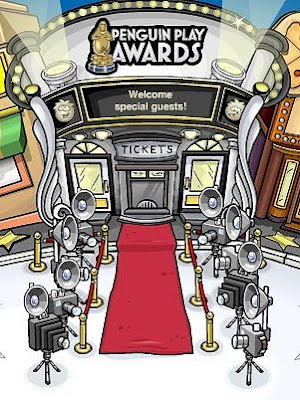 It's great , Club Penguin doing next PENGUIN PLAY AWARDS! I've got all autographs from the other year! And a new game is great too! Awesome! Does the game have something to do with Herbert? I can't wait to see! finnally,the club penguin play awards are here I can't wait, and a new game even awsomerer. Waddle On Club Penguin and Mimo777! hhmm... card jitsu water or snow? I think the game is card jitsu water and i cant wait to see what it really is! That's sooo coool! I can't wait for th new game! Awesome!! the Penguin Play Awards are great!! the game could be in the mine... i dunno yet though. i reckon the game might be in the mine cant wait to find out cant wait to try and find aunt artic this year at the awards. Awesome! Does the game have something to do with Herbert? I can't wait t see! I think it might have something to do with it. What if he made the cave lol that would be phunie. Could the game be penguins trying to save penguins stuck in the mine?! Maybe something along those lines..idk! SaWEET! I am so ready for a new game. Been getting tired of the games that they have at the moment. The penguin awards should b cool too... Which play are you going to vote for? My favorite is Ruby and the Red. I did send a suggestion of 2 new games. and the second one was a ice hockey game. i wonder if they chose them? I think it means that you will play as a penguin squad dude, and there will be a time limit to get to special penguins! This is for all the people who say they think the new game has to do with the mine. Yeah, I think you guys are right. It could either be in the mine, or something to do with the mine. Hmmmm, got any guesses about what it will be about? I think I will vote for that too! Awesome Maybe it will not be the mine but be snow trekker from the epf game. Also on friday last week i formed a conga line for mimo. Everyone started laughing. We already have a game in the mine. Are there any places that have two games in it? Can't think of one. I'm sooo excited for the Penguin Play Awards! You have no idea how excited I get for Club Penguin. No one knows how excited I get excpet my best friend. But thats mostly because I yell at him and he says. Yup. He's hyper again. I get too excited for Club penguin stuff. Cool, have fun! I've never been a member. I like Ruby and The Red too! I liked the pin cheat. See? I did a little research of Club Penguin rooms. There are actually four rooms as listed above. Wow! Thats so cool! When I want to know about Club Penguin your the first sight I go to. Whoa! I loved the PPA last year! That's where I met the awesome Aunt Artic. She's so sweet! Awesome! Last year, I loved the penguin choice awards. I cant wait for this years!-And a new game? Im tingling with excitement. I think it will be a adventure like game ike in the "avalanche rescue" episode. remember, we were rescuing penguins with a live preserver hooked on the a fishing hook... it was pretty awsome. this will be like that. I think. Good thinking. Lets hope its fun! I cant wait! Aunt Artic rocks! They both sound interesting. oh no. Now I really can't wait! Don't worry about it. Non members will for sure, hands down, will be allowed.